I’m not writing about couples deciding when or if there’s a good time to have kids. I’ll leave the timing, good or bad, planned or surprises to those with more wisdom than I and people still of child bearing age. I frequently get a call or message from a potential customer asking about a fishing trip with me. The person sounds excited and optimistic with what they learn, but when they say, “Great, I’ll get with the others and see what day will work for us,” I know it’s probably a no-sale. Trying to get three or four peoples' schedule to coincide perfectly is unlikely to happen in this age. My advice to them (and to you readers wanting to plan a fishing trip or other family outing) is to pick a date, make the date and then put on “the big-boy pants” and just tell the others, “This is the day we are going fishing.” (Or hiking or to the zoo, or....). Realize, few family things short of weddings and funerals are so unchangeable, the scheduling is indelible. 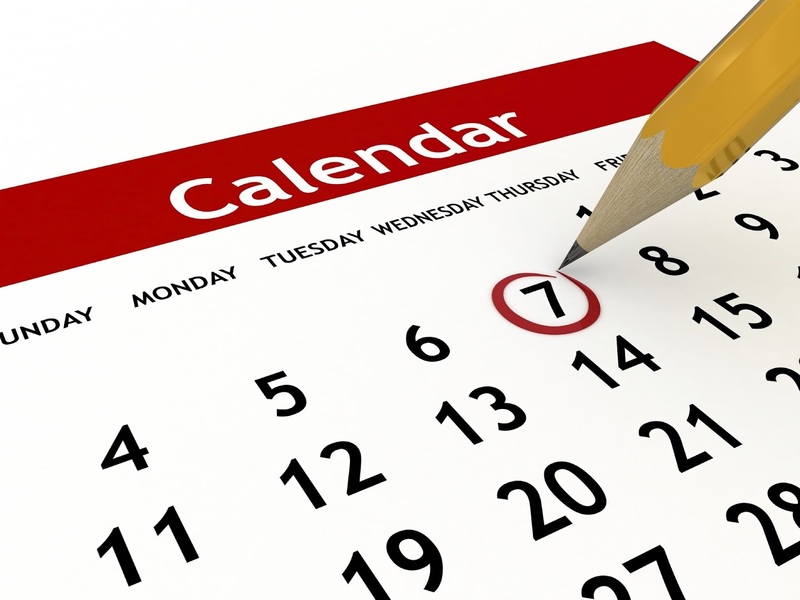 If scheduling were easy, we could all spend New Year’s Day planning every activity for the following year. 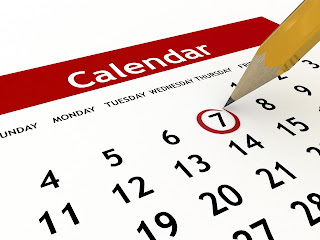 In truth, plans are being juggled all the time and if you plan “unalterably” the day you and others are going fishing, almost miraculously, other plans (short of weddings and funerals) can be rescheduled. No more excuses! Put on your big-boy pants and give me a call. Let’s go fishing. One day a few years ago a friend was fishing in his boat in the same area I was piloting the Brother Nature. We were in radio contact and regularly gave each other updates about how our fishing was going. For some reason the “early” bite on his boat died down to almost nothing while the people on my boat were still reeling in salmon, one after another. 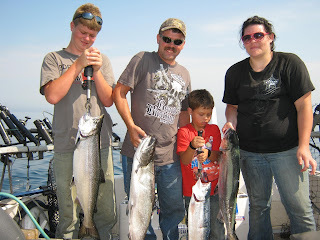 Southern Lake Michigan captains are always good about telling each other where and how they are catching fish with other fishermen. So it wasn’t long until I was coaching my friend about the lures, how deep and all the other particulars. Ever since, it’s become a joke between the two of us. Each day we fish near each other, one of us will radio to the other asking about our choice of under shorts for the day. It got me wondering. Almost all fishermen are superstitious. Some wear the same hat for luck. 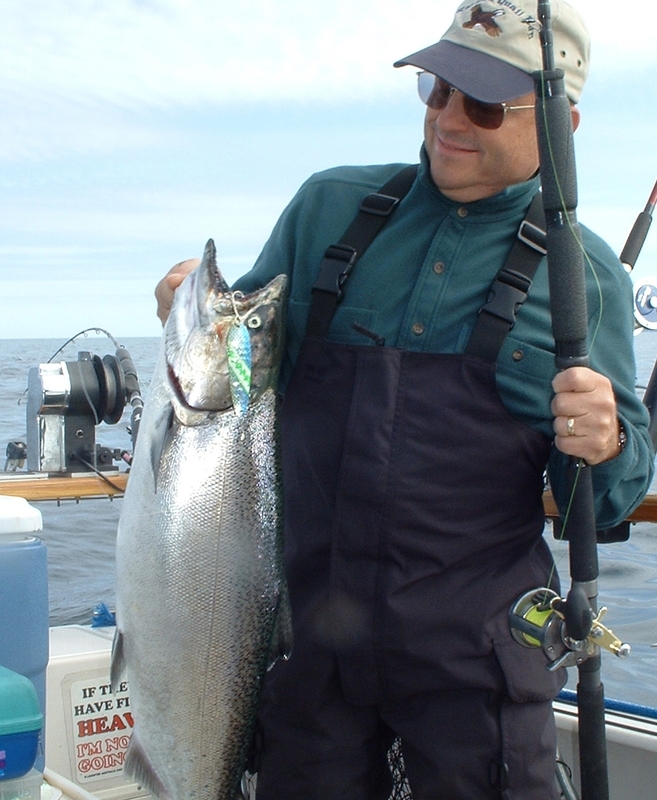 I have a friend who swears he has lucky sunglasses he only pulls out when the fish are proving particularly reluctant to bite. Does the color (and/or style) of undies hiding under my jeans put out any fish-catching mojo? I hope not. I have enough details with which to keep track of each day without starting each trip by matching my choice of boxers to the wind direction or some other factor. Still, when I got the email advertisement from AFTCO, one of the most trusted names in fishing gear, announcing the addition of “Fishing Camo” pattern boxers to their line of fishing shirts, shorts and other apparel, I had to take a look. What do you think? Would I look good in these? (No.) But would it make any difference to the fish? Unlike some places with set dates for open and closed seasons, the fishing season on Lake Michigan is open all year around. It’s Mother Nature and the fish making the determination as to where and when the “season” will be open. At this time of year it’s all about ice out. 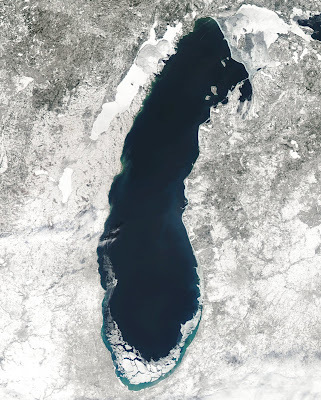 The photo here was taken from a satellite in mid-February. 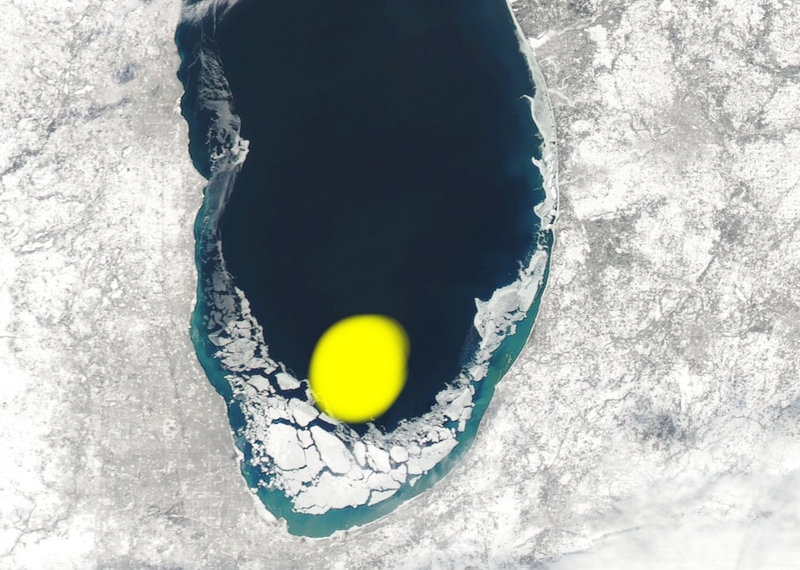 As you can see, the 2017-18 winter didn’t produce a significant amount of ice in total and what is there has blown down to the south end of the lake. That ice and the ice inside the marinas where I launch and load the boat are all that’s between “wishing and fishing!” A few warm days with south winds and it’s game on! The photos here show what’s happening. 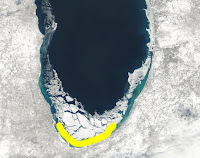 The one on the left shows approximately where all the cohos in Lake Michigan are now swimming. 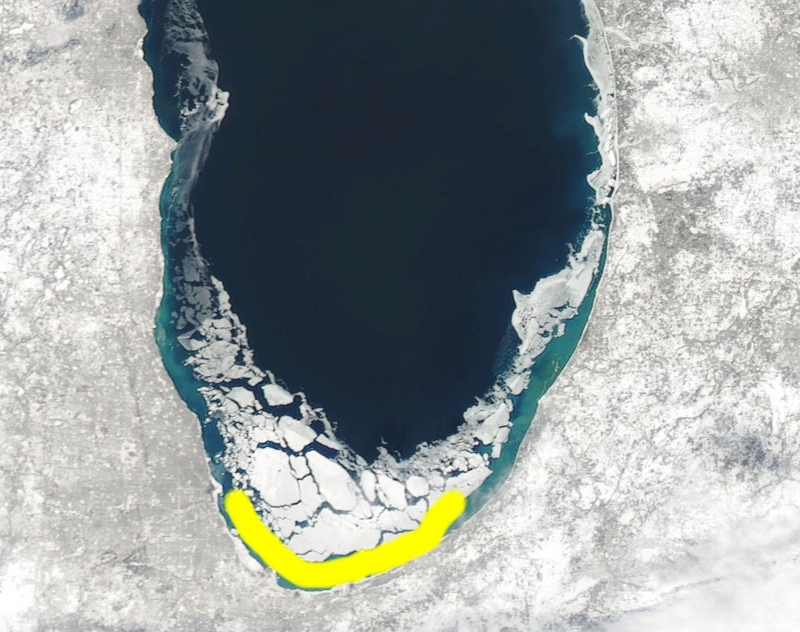 That zone was the last area to cool down in the fall and winter months and where the salmon schooled up (huddled up?) trying to keep in their preferred temperature range. It won’t be long until the “wishing” will be over. The fishing season will be underway!